Primus Windpower has replaced their Air Breeze Land turbines with the new AIR 40 model. With upgraded circuit boards, the AIR 40 is more advanced and designed to handle extreme weather conditions. The improved programming in these circuit boards also allows the AIR 40 to produce more energy, more consistently in a wider range of wind conditions. The Air 40 is more quiet than the AIR 30, and though technically it has a lower watt rating (AIR 40 is rated at 160 watts and AIR 30 is rated at 400 watts), the AIR 40 on AVERAGE produces more energy than the AIR 30, due to it's improved design and lower start up speed. AIR 40 comes with a 5 year limited warranty. The AIR 40 turbine is recommended for use in small battery-charging applications: remote homes, telecom, industry, lighting and more. The AIR 40 is an ideal wind turbine for hybrid systems with solar to offset those cloudy or wintery periods. Not for use in marine environments. Please Note: The AIR 40 Series Turbines do not include a stop switch, it must be purchased separately. 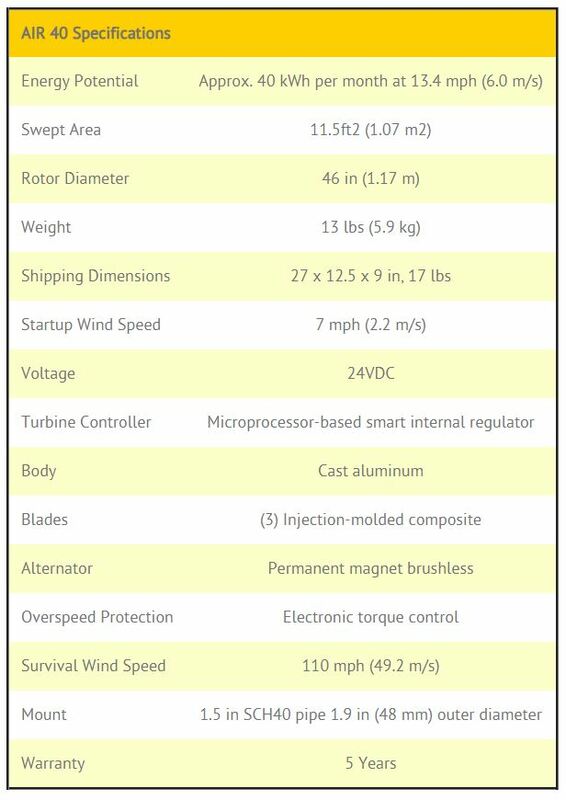 Click the button below to add the Primus Windpower 1-AR40-10-24 24 Volt DC Wind Turbine Kit w/Built-In Regulator to your wish list.